Abbadia di Siena 12 is a large residence on two floors, capable of holding up to 12 persons with 5 double bedrooms, an extra bed and a single sofa bed in a study. It has 4 complete bathrooms, air conditioning in the living room and in the kitchen, Wi-Fi in the living room and on the terrace. Guests can also use the private swimming pool, an outdoor area perfect for meals and a private garden. The property, fully restructured and furnished whilst maintaining and giving value to the original aspects of the house, is on two floors and measures about 200 sq. m.. Two French doors lead to the bright, spacious living room, with a sofa, armchairs, a TV, oval fireplace and large dining table. The kitchen is fully equipped. Rounding up the ground floor are a double bedroom with access to the garden, a study with single sofa bed and access to the garden, a double bedroom, a bathroom with bathtub, a bathroom with shower. From the living room, a staircase leads to the first floor where you will find a double bedroom with bathroom with shower, a living room with a large fireplace and cooking area, a dining room with a table for 12, a double bedroom with fireplace and added bed (ideal for children), a double bedroom, a bathroom with shower. Abbadia di Siena is on the outskirts of a small town near Siena, immersed in the Tuscan countryside and surrounded with vineyards, olive groves and woods. The villa has central heating, air conditioning in the kitchen and the living room, Wi-Fi in the living room and the terrace, baby bed, hairdryer and parking. The price includes: bathroom, bedroom and kitchen linen, along with swimming towels (all changed weekly), internet, water, gas and electricity consumptions, final cleaning. Upon request and to be paid for at the property are a cook, cookery courses, babysitter, hired help and extra linen changes. The location is perfect for those looking to relax and recharge in contact with nature and for visiting Chianti with its world-famous wines, Crete Senesi and towns like San Gimignano, Pienza, Montalcino and Siena (just 6 km away), all of great touristic and culinary interest. 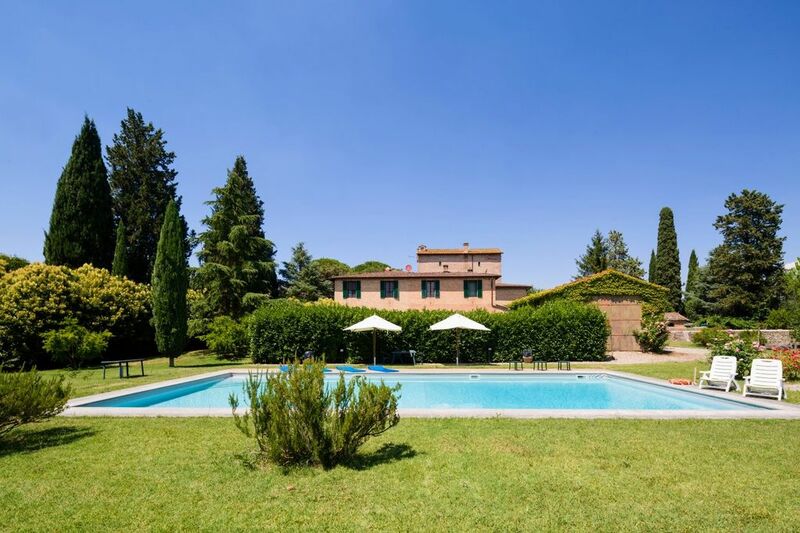 The villa is also close to the motorway, for reaching Florence and the other bigger towns and cities in Tuscany. 8 km Siena city centre, 35 km Castellina in Chianti and Montalcino, 47 km San Gimignano and Pienza, 82 km Florence. Villa Abbadia di Siena si è dimostrata un'ottima scelta. In una posizione adiacente alla città di Siena ma immersa già nelle sue colline, un giardino molto grande, piscina stupenda, area esterna per BBQ con un grande piazzale, ampi posti auto, una grande cucina e zone living adatte anche a gruppi numerosi. Camere comfortevoli e silenziose. E' certamente un'ottima opportunità! Da rimarcare la gentilezza e disponibilità degli addetti alla consegna e ritiro delle chiavi, persone squisite. Alcuni suggerimenti: far trovare almeno qualche piccolo elemento di prima necessità (es: zucchero, caffé, liquido per lavastoviglie, olio, sale...): è vero che il primo supermercato dista 3-4 km, ma su alcune cose non ci si pensa e ci si puo' dimenticare. Per il resto, davvero consigliata, come consigliato è il servizio offerto da Vacavilla, veramente impeccabili, disponibili ed efficienti.